Recently, some blockchain based technologies have started supporting Ricardian Contracts. For example, back in March, Block.One claimed that they were working on support Ricardian contracts. The new EOS Ricardian Contact and the introduction of a new type of digital agreement raised many eyebrows as well as interest in the topic. In this article, we will learn about this new type of contracts recently introduced to the blockchain along with Ricardian clauses. 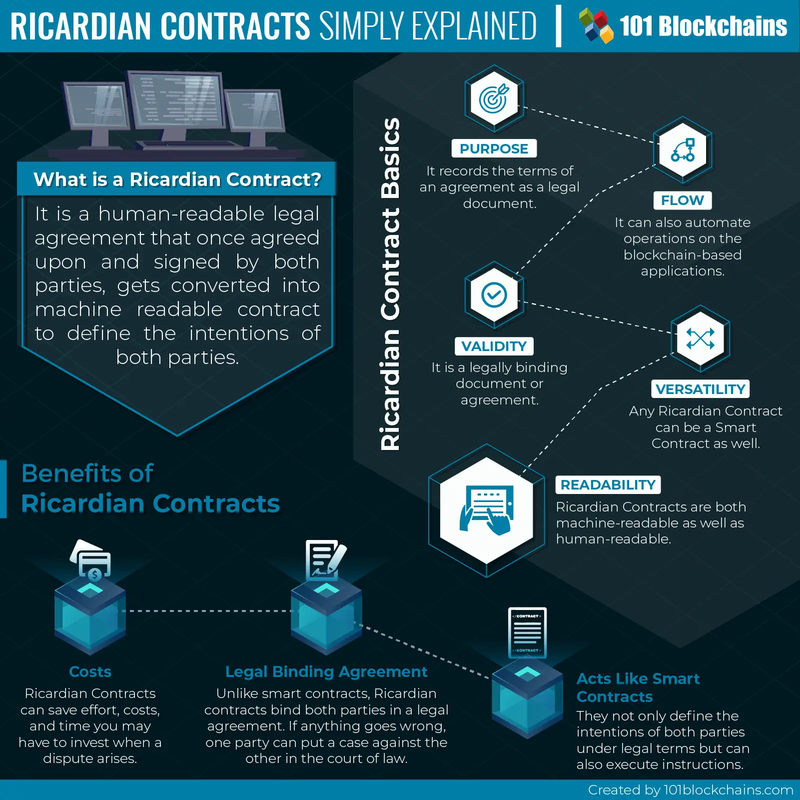 Those of us who have the basic knowledge of blockchain already know about the Smart Contracts, but now is the time to learn some more about the Ricardian Contract and the Ethereum Ricardian Contract as the concept is relatively new to the blockchain. What are Ricardian Contracts? Second Generation of Smart Contracts! What makes it unique is – it is cryptographically signed and verified. Even when it is a digital document, it is available in a human-readable text that is also easy to understand for people (not only lawyers). It is a unique legal agreement or document that is readable for computer programs as well as humans at the same time. Simply put, it has two parts or serves two purposes. First, it is an easy-to-read legal contract between the two or more parties. Your lawyer can easily understand it, and even you can read it and understand the core terms of the contract. Second, it is a machine-readable contract as well. With blockchain platforms, these contracts can now easily hashed, signed, and can be saved on the blockchain. All in all, Ricardian Contracts merge legal contracts with technology, blockchain technology to be precise. They bind the parties into a legal agreement before the execution of the actions on the blockchain network. Even though Ricardian Contracts are something new to the blockchain, but it is three decades old concept. The Ricardian contract is not the only modern term related to blockchain that was introduced in the 1990s. Many recently applicable ideas like Smart Contracts and Proof of Work also introduced at the same time but implemented later when blockchain went mainstream. Ricardian Contracts were initially introduced as part of the Ricardo Payment System back in 1995. Ian Grigg, who was the man behind this new type of legal document, is considered as one of the pioneers of financial cryptography. The interesting thing is, when he developed Ricardian Contracts, he was still in school. This is why people also call these Ian Grigg Ricardian Contract. Anyone who can read his work can realize that he was well ahead of his time. He developed an interesting concept to digitize a legal contract or any financial instrument or asset. However, in the 90s, the appropriate technology to implement his ideas according to their merit was not available. But this limitation is no more there after the emergence of the blockchain technology. He is also popular for his work on digital cash systems and triple-entry accounting. 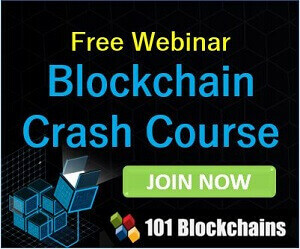 You can also check out his latest interview in which he warned how the traditional banking system is on the verge of collapse and the role of the blockchain technology in the financial sector in the coming years. He is also working as a partner in Block.One, one of the leading providers of high-performance blockchain solutions in the world. It is also the same company that introduced the concept of Ricardian Contracts to the blockchain which also called EOS Ricardian Contracts. Blockchain uses another major form of digital contract, called Smart Contracts. So how these Ricardian Contracts any different from already in use Smart Contracts? Let’s explore the differences in detail. Just like Ricardian Contracts that we discussed earlier, Smart contracts are also machine readable contract, or you can say, set of instructions that control and direct the upcoming actions and events. In the blockchain industry, Smart Contracts act as contracts to provide trust during an exchange. You can use these contracts to exchange money, shares, property, and other assets on the internet. You can do that by defining obligations between two parties and executing them through computer code. They are an essential part of the process on blockchain network where the parties remain anonymous. The only issue with Smart Contracts is that they are not legally binding agreements, which is why, if anything goes wrong, it is hard to prove a case against fraud or scam in the court of law as it is not a legally binding agreement. The second core difference is it is not human readable as well. It is just a code, but Ricardian contracts are readable by both humans and machines. You can read our detailed guide for beginners on Smart Contracts as well if you want to learn more about Smart Contracts. On the other hand, Ricardian Contracts outline the intentions as well as actions based on the legal agreement that will take place in the future. The fundamental difference between both of the contracts on blockchain platforms is the type of agreement. One (Ricardian contracts) records the agreement between multiple parties, while the other (Smart Contracts) executes whatever is defined in the agreement as actions. Ricardian Contract is a legally valid contract while Smart Contracts are not. It turns a human-readable legal contract into machine readable code that can be executed by the software. Simply put, Smart Contracts automate the actions on a blockchain application. However, they also have some limitations, as you cannot have a clear idea of what happens next in many scenarios. In that case, you can’t use Smart Contracts to automate something that you are not sure of. In such a case, if an event occurs that is not planned for in the instructions provided in the Smart Contracts, it can cause a significant problem. As a Smart Contract also doesn’t have any legal framework that can define how to proceed forward in such an event, it just doesn’t work in such cases. You can also say, Smart Contracts lack an ability to evolve around such scenarios in the absence of a legal framework. This is precisely where Ricardian contracts come in. It adds to the intentions and brings clarity to the actions by adding a legal framework to the contract. It defines the contract intentions and answers many questions that remained unanswered by Smart Contracts. For example, it answers what to do if there are any applicable consequences of an action? It defines the scope of the contract. It also describes the parties involved and their representatives if any. Most importantly, Ricardian Contracts define the regulations in legal terms that can be used to resolve the dispute. Prior to the Ricardian Contracts, prevention of fraud and conflict was not easy in the crypto industry. Ricardian Contracts allow more security to participants who want to invest or make use of the blockchain technology. In addition, Ricardian Contracts can be used to add authenticity to the process of selling or buying an asset on the internet or the blockchain network. Ricardian Contracts can define in legal terms what you are buying or selling, and under what legal terms, who are the participants, and more legal information about the exchange. Simply put, Smart contracts when merged with Ricardian Contracts can provide a robust and foolproof process for trade on the internet. In such case, it become Ricardian Smart Contract. Also, a Ricardian Contract can act and do the same as a Smart Contract, as you can define both legal terms and instructions to execute as a code, but a Smart Contract cannot act as a Ricardian Contract. What Information Do Ricardian Contracts Contain? Anything that can be programmed to define a legal contract between multiple parties, as well as instructions that can be used to execute an event or action, can be part of Ricardian Contracts. How many parties are involved? Who are the parties making this agreement? Who are their representatives? What is the validity of the contract? Is it applicable for a limited period of time or forever? What does it define in terms of time? For example, a deal needs to be reached within three months, or the contract gets null and void. For example, what happens when one of the party dies? Or similar exceptions. You can add any and as many conditions, and if/then clauses as you want. Ricardian Contracts are primarily a human-readable legal contract between the two parties. You can use this agreement in the court of the law as they bind you and the other party in a legal agreement. You may need lawyers to create the actual legal agreement after which both parties can read, understand, agree, and sign the document. Only after that, you can digitalize or hashed so that it can be used by the software to run on the blockchain platform. For the validity of the legal contract, an issuer can create a legal framework. Both parties or holder fill that legal framework and agree on it by signing it. Keep in mind, Ricardian Contracts are a type of Smart Contracts or use the code used in Smart Contracts. They are also live contracts, that can be changed after the execution of an event. For example, in the case of a contract that is about buying and selling of a car between the two parties, one clause can be about contacting an authority that can confirm if the seller is the actual owner of the vehicle. Once you have the information, you can add it to the Ricardian contract, creating a new version of the contract. This way the Ricardian Contract execute different events, and moves towards a logical conclusion based on the outcome of each event. Once the contract is prepared, it is signed digitally, and the contract is agreed to refer to the hash of the contract. For example, if there is a financial transaction taking place under the agreement, the transaction will apply to the hash of that contract, along with paying parties. Ricardian contracts also use hidden signatures to make the process more secure. The signing of the contracts takes place through private keys. Later, the hash of the agreement is used to attach that hidden signature to the contract. Yes, they are. Ricardian Contracts are very secure as they use cryptographic signature. Each document in the contract has unique identification by its hash. What does this mean? This means once it is agreed upon by both parties, and turned into a machine-readable form, it is impossible for anyone to arbitrary change the legal agreement. This also offers protection from a commonly used tactic in legal agreements called frog boiling. Under traditional legal agreements, an issuer with upper hand keeps changing the terms in the agreement during the execution. This is not possible with the Ricardian Contracts. To sign Ricardian Contracts, you can use private keys. When you add the signature of the issuer of the contract to the document, it creates a legible and binding agreement about the information described in the document. It is also possible to track the parties involved with the help of the private key and hold them accountable. For the first time, it allows legally-enforceable transfer of physical assets as well as rights on the blockchain network, which was not possible with Smart Contracts. When smart-contracts were also used for the same purpose, but they can’t legally-enforce the transfer. Ricardian Contracts can save effort, costs, and time you may have to invest when a dispute arises. The machine-readable legal contracts are not open to any interpretation, which is the main drawback of human-readable legal contracts. Lawyers can interpret the content based on their liking which may result in a conflict. Ricardian Contracts are a significant step forward in adding more transparency to the blockchain network. Are There Any Concerns about Ricardian Contracts? As it is still early days for the Ricardian Contracts, some things still need answers or more clarity. For example, who will enforce the Ricardian contracts? It is still an unanswered question that how arbitration can be integrated into the EOS ecosystem. Similarly, how can users file claims? However, Ricardian Contracts are based on pre-defined and pre-agreed legal contracts. Pre-agreed and legally binding means when the time arrives, you can produce those to the judges in the court. Ricardian Contract can at least let the arbiters decide about the original intent as well as obligations. On the other hand, the technology is still under the full development phase. The legal framework that revolves around Ricardian contracts is still lagging as we seek more clarity. Are there Any Current Applications of Ricardian Contract? Yes, there are some Ricardian Contract examples. One of the prime Ricardian Contract examples is OpenBazaar. As the name reflects, it is an open online marketplace where you can buy and sell anything. This platform currently uses Ricardian Contracts when the two parties exchange goods as a primary tool to track the liability of the parties. So how does it work? Well, whenever two parties make an exchange on the platform, it creates a Ricardian Contract. It tracks the legitimacy of the legal contract that multiple parties agree to and signs to proceed further. This makes the platform very secure for the users. Why? Because if the case of scam or breach of contract, one party can have legal document and record to produce in the court of the law. This is why Ricardian Contracts can have a major use in the e-commerce industry, adding another layer of security for users. You can read more about the use of Ricardian Contracts on OpenBazaar and how they implemented the concept on their blog as well. Ricardian Contracts can be implemented in a large number of cases, even more than Smart Contracts. Usually, Smart Contracts are used mostly for financial transactions on the blockchain. However, there is no limit to the use of Ricardian Contracts and you can also use them for other applications other than financial transactions. As a Ricardian Contract determines responsibility or in legal terms, the liability of one party when trading with another party, the applications are vast. This is why most experts believe that the use of Ricardian contracts on EOS will only go mainstream in near future. Ricardian contracts can become an important part of agreements on blockchain and can replace Smart Contracts, as they can also act as a Smart Contract at the same time. That is, they can define the intentions of parties, legally bind them in a contract, and also execute the instructions based on the agreed upon terms. This only makes blockchain transactions and trading better, secure, and more transparent. It is still early days for Ricardian contracts as the use of these contracts is new. They recently become part of the EOS ecosystem. However, as the blockchain evolves along with Ricardian Contracts, we can have a better picture of the future in the next few months. To summarize what we discussed so far, Ricardian Contracts are a powerful new type of code that can have a significant impact on the trade on the blockchain network, making the process more secure. It aligns the legal agreement and terms as a contract with machine-readable code for execution on the blockchain network. Even though it is a decades-old idea, but the blockchain technology makes it possible to make the most out of it. Blockchain allows us to notarize these contracts, secure them on a blockchain network, and keep a complete reference of the matter. It can add more clarity to the legal contracts between multiple parties and can save time, cost, and efforts as it eliminates the chances of disputes. When merged with Smart Contracts, they can also invoke functionality and actions. However, we still have to wait to few more months to see how Ricardian Contracts can change the blockchain trade. Also, in the next few months, terms like Ricardian clauses, Ethereum Ricardian contract, and blockchain Ricardian contract will have more clarity. As a miner myself, a cryptocurrency enthusiast, and a blog writer for several years, I write on multiple cryptocurrecny blogs to help the world get more familiar with the cyrptocurrency and the future that lies ahead.